← Parma Number 46: The Aspley Hotel … Not as advertised but still pretty good! The Verdict: I can not recall ever during the last 46 parma tests not finishing the chicken piece that forms part of the meal. That changed at the Criterion Tavern with parma number 47. The other elements of this dish were actually quite good however the chicken piece, I am sad to say, tasted terrible. So much so I found myself peeling off the ham, cheese and tomato sauce to imbibe them separately. Enough said. Chicken Piece: The title of this post speaks for itself. I could only get through four bites of the chicken piece. I confess that I have never tasted anything like the Criterion’s chicken piece. I do know it did not taste like any chicken I have ever eaten. I will leave it at that. Tomato Sauce: The tomato sauce on this dish was actually quite nice. It covered the chicken piece well and tasted great. It combined with the cheese and ham well. Ham: I originally thought that the problem with my meal, which ended up being with the chicken, was the ham. How wrong I was! Once I separated the ham from the chicken piece I found it to be excellent. It covered the chicken piece well and tasted great (yes I know I am repeating myself). Cheese: This was another element of the Criterion chicken parmigiana that was really quite good. There could have been a touch more of the cheese on the chicken piece but it was well melted and complimented the ham and sauce well. Side Dishes: The Criterion does not offer a set menu for the side dishes for its chicken parmigiana and that meant I got to choose between salad and coleslaw. I went with the coleslaw and I found it be very nice. It was crunchy and fresh. The chips had been well cooked and tasted great. My only criticism of the chips would be that they needed more salt. Presentation: This meal was presented quite well. The chips and salad were in their own bowls and the chicken piece was not on top of any of the elements. The Venue: The Criterion Tavern is on the corner of George Street and Adelaide Street in the Brisbane CBD. It is a largish bar with a good range of beers on tap and well appointed TAB area. My chicken parma cost $16.50. The Final Word: This chicken parmigiana had many excellent elements and if the chicken piece had have been close to the mark it would been in the top ten of the parmas I have tried thus far. The chicken, not wanting to belabor the point, did not taste like any chicken I have had before. 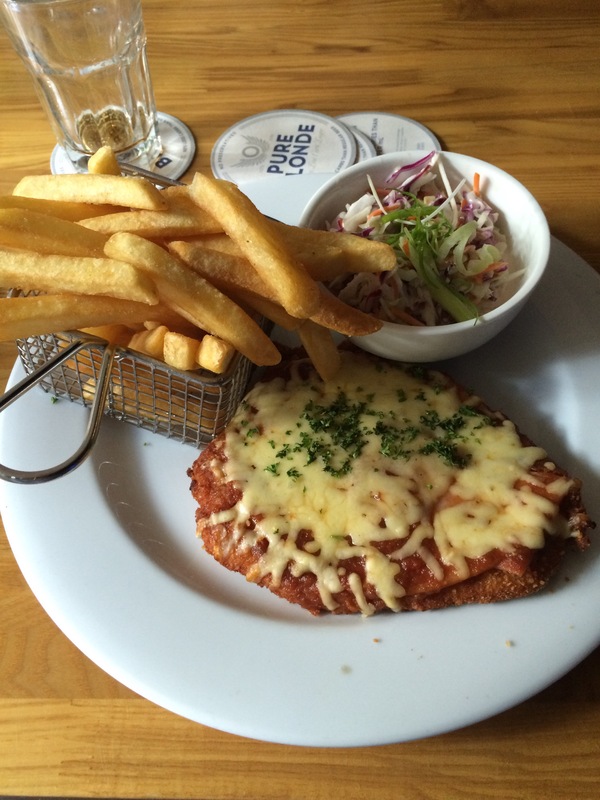 This entry was posted in Uncategorized and tagged Brisbane, brisbane's best parma, chicken parmigiana, criterion tavern, food, Parma. Bookmark the permalink. 1 Response to Parma Number 47: The Criterion Tavern … when 4 bites of chicken was too much! This testing of any chicken dish can be dangerous work. Hope that you are OK and not sufffering the dreaded ‘Chook Runs”.